Ingredients 2 bananas 1 cup blueberries 2 Tbsp ground flax meal 2 Tbsp honey 10 fresh mint leaves 1 ½ cups Lactantia® Lactose Free 2% Milk ¼ cup ice Instructions In a blender, combine the bananas, blueberries, ground flax, honey, mint and Lactantia® Lactose Free 2% Milk. Blend mixture for one minute or until smooth. Add in the ice, and blend until fully crushed. This blueberry banana smoothie tastes delicious and has many added health benefits with ingredients such as flax seeds, antioxidants and a touch of sweet honey. Best of all, it’s lactose free! 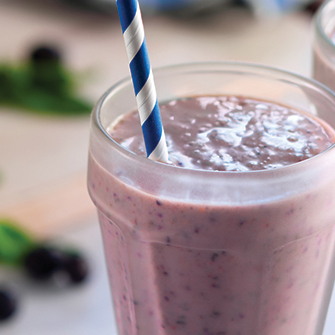 In a blender, combine the bananas, blueberries, ground flax, honey, mint and Lactantia® Lactose Free 2% Milk. Blend mixture for one minute or until smooth. Add in the ice, and blend until fully crushed.